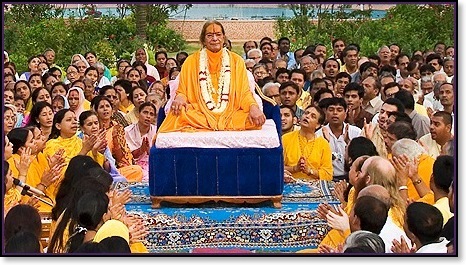 Kripalu ji Maharaj explains that every soul of the world desires only eternal Divine Bliss. Since eternity, each soul has been trying every moment to attain this Bliss. Even after so much effort in uncountable births, we haven’t been able to attain even a trace of that . Why were we unsuccessful? We directly prayed to God. In other words, due to our pride, we never accepted and surrendered to a true Saint. According to the Ved, the first step in attaining absolute supreme God Krishn is to surrender to a true Saint. Your goal can’t be achieved from a Saint who has left the material world and gone to the Divine abode. Krishn said very clearly to Arjun in the Gita, “O Arjun! Surrender to a true Saint.” Krishn strongly emphasized complete surrender to a Spiritual Master while having no material desires in one’s heart. With sincere, you must acquire Divine knowledge by asking devotional questions of your Spiritual Master. Many innocent people think there is no need for knowing spiritual theory and that we should just chant, ‘Radhey Radhey’. But spiritual theory is very important. God is omnipresent. God resides in everyone’s heart. God has established Himself in His name, form, qualities, leelas, and abode. Still the souls aren’t benefitting. Why not? This is due to spiritual transgressions. A person might shed tears for his Spiritual Master and God, but at the same time he may think negatively about Them. He applies his intellect, which is material and thus unable to understand the divine. One has to surrender his intellect to God. When a person applies his intellect his surrender ends, and, on top of this, he commits spiritual transgressions by being critical against his Spiritual Master and against God. transgressions arethe greatest sin. The Ved describes procedures for the atonement for all kinds of sins, but there is no atonement for spiritual transgressions. Only the Saint who has been offended can forgive a soul. Even God can’t forgive a spiritual transgression. If we do not acquire the knowledge as to what is God, soul, maya, mind, intellect, surrender, and detachment, and if we don’t sincerely understand these subjects in detail, we will apply our intellect to God, His names, forms, qualities, leelas, abodes, and Saints, and we will commit transgressions. For this reason, Krishn says in the Gita that just asking your Guru devotional questions will not work. You must also serve the Spiritual Master. Your aim is to attain Divine happiness. So only by serving Krishn and Guru one can attain the highest kind of happiness. The final goal of a soul is to attain selfless Divine service. As our desire to do increases, purification of our mind and heart takes place with the same speed. We will progress towards God at a faster rate.